Can be used on any Flat Surface a tailgate rear window where ever you want it! Shipped with detailed install instructions! 1 FULL COLOR PRINTED 8" X 8" Zombie Outbreak Response Team #2 trailer, or window Universal Graphic Decal ! These are a super easy way to make your Car or truck, standout from the rest!! Even work on a WALLS! 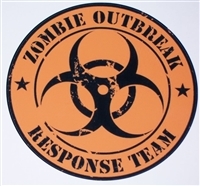 1 FULL COLOR PRINTED 8" X 8" Zombie Outbreak Bio Hazard Response Team #4 trailer, or window Universal Graphic Decal ! Pick your color from the drop down Menu below. Low riders are for boys who cant get it up! Decal with Monster truck! Pick your size from the drop down color menu below! Made with top grade Vinyls!! ECKO UNLIMITED DECAL! 1 FULL COLOR PRINTED 8" X 8" Zombie Outbreak Response Team #1 trailer, or window Universal Graphic Decal ! Made with 8 year vinyls!! 2 FULL COLOR PRINTED 8" X 8" Zombie Outbreak Response Team #2 trailer, or window Universal Graphic Decal ! 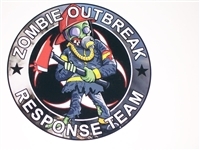 2 FULL COLOR PRINTED 8" X 8" Zombie Outbreak Bio Hazard Response Team #4 trailer, or window Universal Graphic Decal !